According to the World Health Organization, more than 1 billion people on Earth do not have safe drinking water. A group of surveyors and engineers from Colorado is working to make that number smaller. And in the process, they are cleaning up a boundary dispute. Engineers Without Borders (EWB) is a global, non-profit humanitarian organization that partners with developing communities to improve their quality of life. The Fort Collins, Colorado, chapter of EWB “adopted” the Peruvian village of Santa Rosa de Dinamarca, offering assistance and expertise. Helping Santa Rosa de Dinamarca is a long-term project, expected to take three years or more. Santa Rosa de Dinamarca lies in the flatlands of eastern Peru. It’s only about 40 km (25 mi) in a straight line from the provincial capital of Pucallpa, but traveling to the village requires a six-hour boat trip on the Ucayali River. There are about 200 families living in the village. Water for the residents comes from a few wells, and many residents must carry it in buckets more than 1 km (0.6 mi) to their wood and thatch huts. There is no sanitation system, and the wells are infested with e-coli bacteria. As a result the villagers are often ill from drinking contaminated water. Intermittent electricity comes from a 5Kw diesel-powered generator in the center of the village. After researching the village, the EWB team developed plans to drill a new well and install solar-powered pumps, filters and tanks to provide clean water for the village. TST Consulting Engineers’ Surveyor John Von Nieda, LS, is one of a small team of EWB members who volunteered on the project. He enlisted assistance from Bryan Baker of Frontier Precision, Inc., who agreed to supply Trimble hardware and software as well as technical expertise for the project. The team first visited the village in July 2007. They planned to map the existing facilities and develop details for the water system. However, the villagers had a new and different priority that radically changed the scope of the EWB visit. Santa Rosa de Dinamarca is home to the indigenous Shipibo people, whose lands and culture are protected by the Peruvian government. While ownership of their land is guaranteed, boundary lines exist only on rudimentary maps and drawings. There were no monuments in the field, and non-Shipibo people from the north were encroaching into Shipibo land. When the Dina – marcans learned that the EWB team included surveyors, they asked them to also solve the boundary dispute. The team checked the boundary using Trimble Terramodel Software and tied the data to WGS84 coordinates on the map. 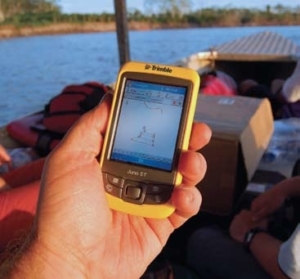 On the river trip to the village, they had plotted the river’s location using a Trimble Juno™ ST Handheld GPS Receiver. From that data, it was clear that the Ucayali River had wandered from its location on the boundary maps and that the riparian boundary data was useless. To mark the boundary on the ground, they had to rely on the Trimble GPS equipment, information from the local residents and their own skill. Von Nieda and Baker had brought with them a multipurpose set of Trimble equipment. For GPS surveying, they had two Trimble R8 GNSS receivers and a Trimble TSC2® Controller. Baker added a Trimble Juno ST Handheld GPS Receiver for use in Geographic Information System (GIS) mapping and data collection. To establish a reference station, the team placed a Trimble R8 GNSS Receiver atop a 5 m (15 ft) pole in the village. 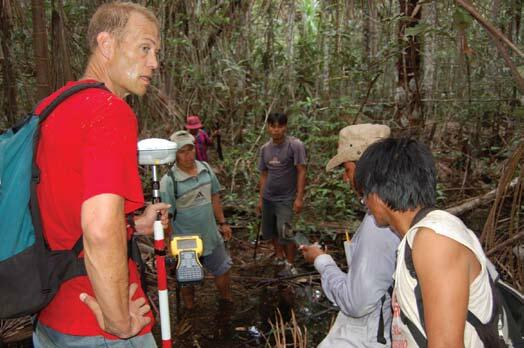 They completed RTK measurements to locate wells and develop topographic data needed to design the water system. All work in the village with their modern equipment was done with an audience of curious onlookers. The boundary work was not as pleasant. Accompanied by machete-wielding villagers, the EWB surveyors went into the jungle to locate the north boundary of the Shipibo land. Using the Trimble Juno ST handheld, the team navigated to a spot approximately on the boundary line. The EWB team finished their topo and planning surveys, then met with neighboring villages to discuss boundary lines. They also collected GPS positions at river junctions and other sites that could be used to tie the boundary descriptions to the ground. The team returned to the U.S. at the end of July and began processing the data. Over the winter, the surveyors completed extensive research and calculations. An aerial photo, taken as part of the 1991 grants, provided the key they needed to finally develop a good model for the boundary. In June 2008, the EWB team again visited Peru. Their first stop was Pucallpa, where they met with government officials to review Von Nieda’s work. After detailed discussions, the officials accepted the boundary and agreed to send a representative to the village to approve the location on the ground. The officials were surprised by the extent of incursions into Shipibo lands and promised to stop further encroachment. To detail the encroachments, Baker conducted an aerial inventory of the area surrounding the village using a Trimble Nomad™ Handheld Field Computer and Trimble ProXH™ GPS Receiver. He mounted digital still and video cameras to the side of a small airplane and connected them to his laptop to record the images. 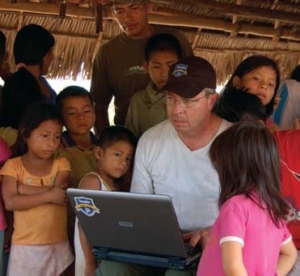 Using the GPS to navigate the plane, the team flew along the Shipibo boundary collecting photos and video. Baker then correlated the images with positions from the Trimble GPS. The characteristics and locations of the encroachments were now documented. Finally, it was time to mark the boundary on the ground. Once more, the team made the river trip to Santa Rosa de Dinamarca. Again accompanied by an army of machete specialists and a government official, Von Nieda and Baker used the Trimble GPS system to locate the approved boundary they had calculated over the winter. The villagers are working on installing monuments and blazing lines along the northern boundary. At last, the Shipibo communal lands are on the way to being permanently marked on the ground. Work continued on the original water system project as well. As an interim step, the villagers will purify drinking water by using simple bucket type filtration systems in their homes. While work on the boundary survey was underway, other EWB members installed 150 of the filtration devices and trained the villagers on their use. There is more work to be done. Von Nieda is planning two more trips with the goal of having the well, pump and storage tank operating by the end of 2009. The people of Santa Rosa de Dinamarca will soon have ample clean water to go with their secure, well-defined boundary.